While I never got round to diving into the diorama world of Toy Soldiers, I spent a fair amount of 1998 dabbling in the world of Army Men, and the conceit appears to be the same. Armies of toys duke it out in a child’s bedroom, finally free from the shackles of their human owners. Toy Soldiers pit tiny troops from the First World War against each other, while Toy Soldiers: Cold Wars brought in 80’s action figures. 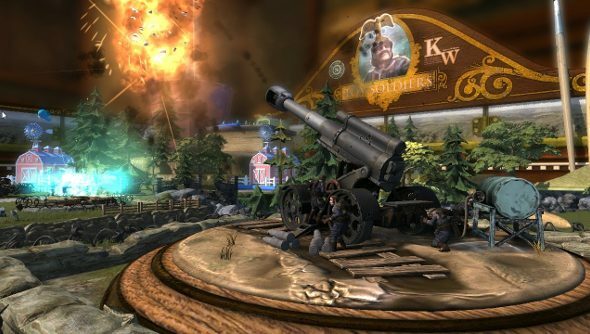 In Toy Soldiers: War Chest, the Kaiser’s army returns, facing three other armies. Only one of them has been announced, and it’s certainly a surprise. I cannot contain my excitement at the prospect of a rainbow unicorn charging at a tank. The other two factions are secrets, at least until closer to launch, which should be early next year. Did any of you lovely lot play the first one?